Newsflow is on the quiet side this morning. Futures, though, are trading higher on the heels of positive price action in Europe. 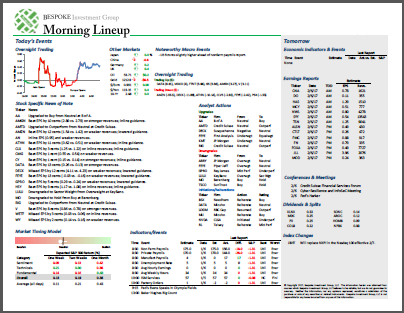 On the economic front, PPI and Jobless Claims will be released at 8:30. The S&P 500 may be trading in a steady uptrend with higher highs and higher lows all year, but the small-cap Russell 2000 just can’t make up its mind. For the last two months now, small caps have been stuck in a range as Banks and Biotechs, the two largest industries in the index, have been a drag. 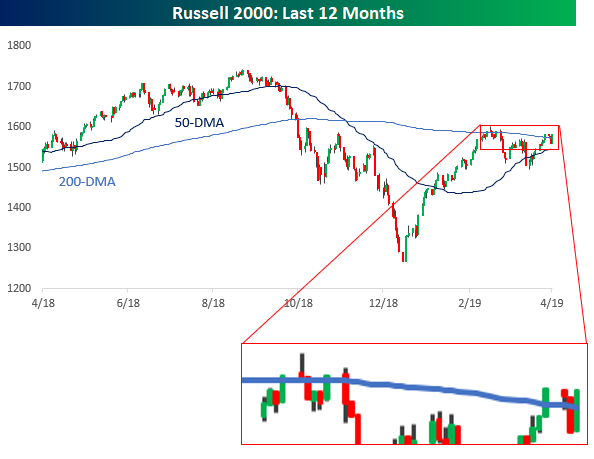 The 200-day moving average is generally considered a dividing line between whether an index or stock is in a long-term uptrend or downtrend. In the Russell’s case, it has been oscillating above and below that level for some time now. With yesterday’s close back above the 200-DMA, that now makes it seven times that the index has crossed above or below its 200-DMA on a closing basis in the last 50 trading days. That’s the most number of crosses in that short of a span in more than four years! In order for this trend to break one of those two “Big Bs” in the index (Banks and Biotechs) is going to have to make a move.